"If you have walked Manhattan streets, visited Central Park, or stood in the atrium of the Metropolitan Museum's American Wing, you have seen the art of Audrey Munson," observes arts journalist Jane Librizzi. Certainly Miss Munson is all over town, mostly undressed. Mrs P, it is possible that Henry Cabot Lodge Jr. addressed this American Venus, in her statue form, while he was pub crawling with H. L. Mencken. New York City Statues has posted a remarkably long list of all the statues in the city depicting Miss Munson. 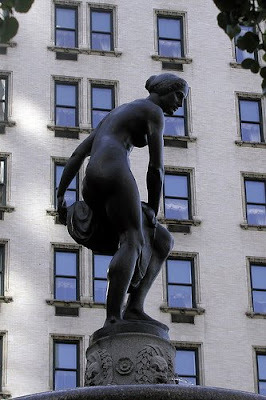 Above she is seen as "Pomona, the Fountain of Abundance" at Fifth Avenue and 59th Street.